Mahendra Singh Dhoni is among the fastest runners between the wickets in international cricket. On Tuesday, the pace came in handy as he tried to dodge a fan, who breached security in pursuit of a hug from the charismatic former captain. Dhoni did embrace the man but only after making him run for it. The 37-year-old was taking position behind the stumps when India began their defence of 250 against Australia in the second ODI. At that moment, a fan broke through the security to run on to the field wanting a hug from the World Cup-winning former skipper. A grinning Dhoni quite literally played hard to get while the rest of the Indian team enjoyed the little moment before the second innings of the match got underway. The man, clad in a white T-shirt, ran after his idol, who relented after a few seconds and embraced him. 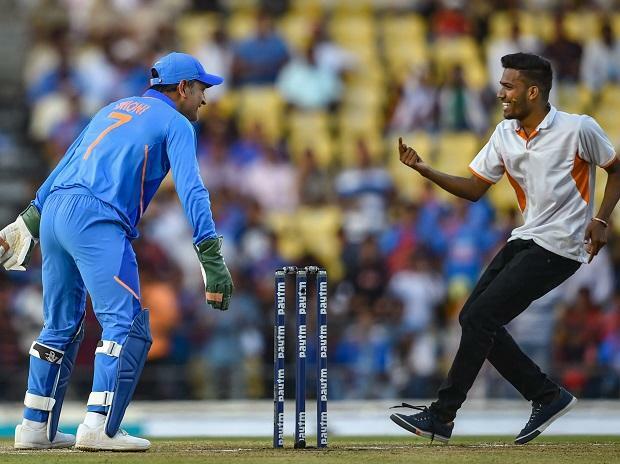 The fan also touched Dhoni's feet before he was escorted out by a Vidarbha Cricket Association volunteer and a few security personnel. Earlier, India were shot out for 250 despite a resolute under-pressure 40th hundred by skipper Virat Kohli.